The Hiya Hiya Interchangeable Knitting Needles uses swivel cables to add a different twist on your work with joins that stay tight and cables that stay free of kinks and curls. The sharp tips and a range of sizes give knitters multiple options for yarn choices. 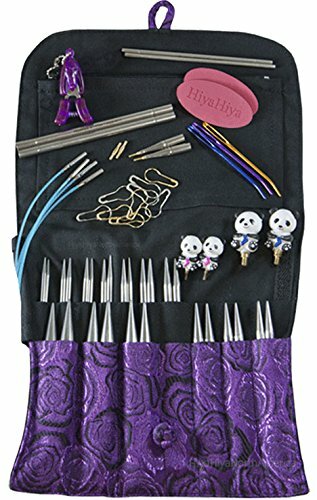 After years of knitting and comparing this set to competitors, we believe this is a great interchangeable needle set for most people. In this Hiya Hiya interchangeable needles review, we’ll take a deep dive into the material, tips, sizes, joins and additional features to give you a better understanding of these interchangeable needles. We’ll go over what we like and dislike, how they compares to other interchangeables, and what you need to know before you buy. Hiya Hiya has a strong reputation in the knitting needle market. With each new product, they continue to innovate and go in new directions. The Sharp Stainless Steel Interchangeable Knitting Needles set is no different. It lives up to the Hiya Hiya reputation for excellence. These interchangeable needles don’t require a special tool to tighten the needles and the swivel cables mean you don’t have to fight a kinking, twisting cord as you knit. 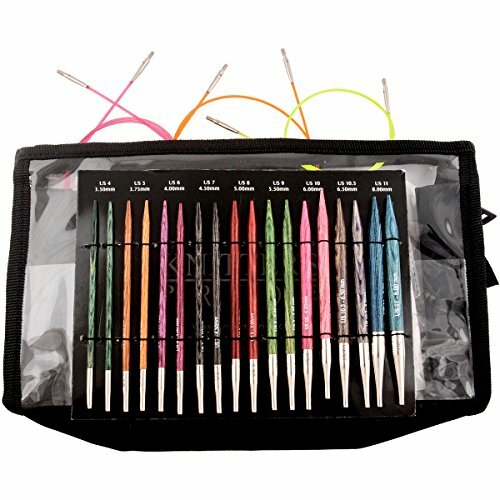 The Hiya Hiya interchangeable needles are a favorite of lace knitters who really like the sharp tips and lifeline hole. Hold on, though. They also work well for sweaters, scarves, hats and socks (using the Magic Loop for the latter). 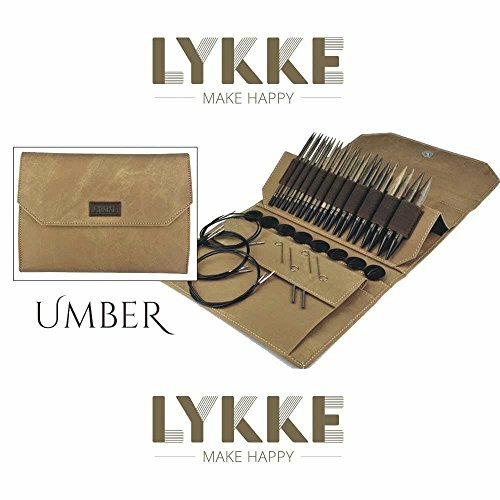 Like all interchangeable circular needles, the Hiya Hiya interchangeable knitting needles can be used for knitting flat or in the round. They might also please anyone who is looking to knit faster as the yarn slides off the stainless steel needle like it was glass. 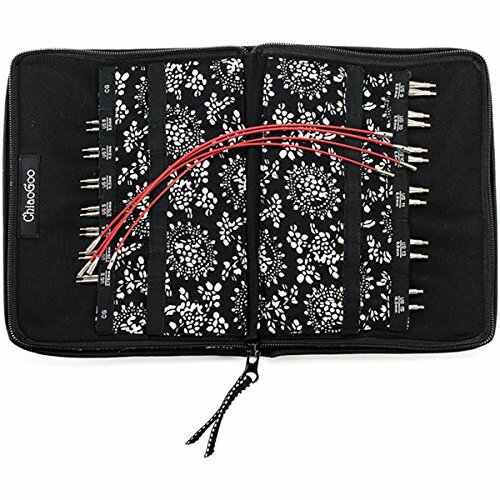 And with pockets for both needles and cords, the case is great for anyone travels or loves to be organized. This set comes with everything you need for a knitting project: stoppers, safety pins, darning needles, and snips. Needle tips. Made from stainless steel, these needle tips may be good for anyone allergic to nickel. The steel allows yarn to glide easily for faster knitting. Cables. Screw type plastic cables make it easy to connect the cables to the tips. This allows the Hiya Hiya interchangeable needles to work well for magic loop or for small items, such as baby socks. Needle. The 4-inch needles in this set work great for knitters with small hands. Additionally, knitters find knitting small areas like crowns of hats or the fingers on a glove stitch-up quickly. Cord or cable. This set comes with 4 cords of 18″, 24″, 32″, and 40″ lengths. Laser-etched cable lengths on each connector join make finding the right length for your project a breeze. Each cable connector join comes with a pre-drilled hole for inserting a lifeline. Sharp needle tips help you sail through tight twisted stitches and tiny lace yarn. If you tend to knit tightly, these tips may make it easier to work stitches. 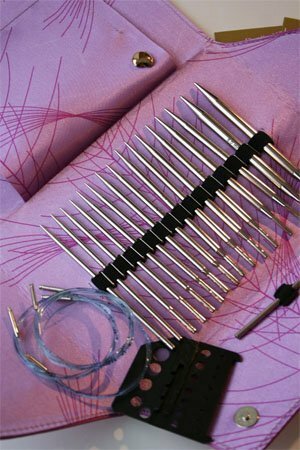 Many interchangeable needle sets starts at size US 4. However, the Hiya Hiya Interchangeable Knitting Needles starts at a size US 2! The 13 sets of tips cover the most popular needle sizes: US 2-15. Each size is laser-etched on the needle tip. These needles have a keyless joins, which means you don’t need a little tin pin to tighten the tip to the cable. This set includes a gripper to help tighten the join. We found the grip is important to use when tightening the needles or they may unscrew while you are knitting. The join is smooth and doesn’t catch on yarn. Another nice thing about the Hiya Hiya interchangeable needles is the swivel cable. Here’s how it works: The tapered metal joins on the cables have an extra tube of metal or barrel, as part of the connector that turns around the tapered join. After you screw the needle tip into the cable connector, the barrel continues to turn around. This swivel join keeps the cable from kinking or bending while you knit. The swivel cable also means you’re less likely to have the cable and needle unscrew while knitting. The turning action happens at the metal tube rather than where the needle tip screw meets the cable join. Pick-up stitches like a pro with these sharp tips. Lace weight and other super fine yarns knit-up quickly. Have you ever tried to k3togtbl using cotton? Not easy, is it? Try these sharp needle tips and see if your luck changes. With tips in sizes 2-15, these needles work well with yarn weights ranging from lace to bulky. Beginning knitters may find they need to practice using these needles with different yarn weights as the sharp tips can split some yarns. You can’t beat the durability of stainless steel. With no coating to rub off, no wood to dent or bamboo to splinter, these needles should last for an infinite number of knitting projects. The flexible plastic cable works well for magic loop or making several pairs of socks at once. As with anything plastic, forcibly bending or pressing the cable can kink it. Although faster to knit with than wood, stainless steel does retain a bit of resistance with some yarns giving just a tad bit of grip. You won’t need to push stitches across the needle surface, but you may not lose as many either. Lightweight needle tips warm-up using them, which helps those knitters with hand fatigue knit just one more row. After all, who wants to stop knitting? 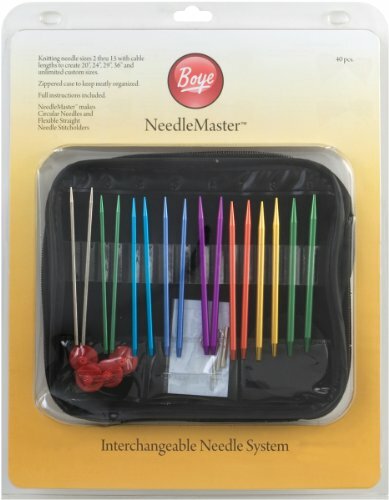 Beginning knitters may find the Hiya Hiya Interchangeable Needles a good choice for learning to work with pointed tips and smaller weight yarns because the stainless steel gives just enough hold to help prevent stitches from dropping easily. Experienced knitters dash through project after project after project with these slick interchangeables and smooth joins. Equal to Hiya Hiya interchangeable needles in all aspects while also including larger sizes in one set. It may be challenging to use the steel cable with the Magic Loop method. Experienced knitters like the speed of these needles. Quick click-in cable connection and one-size cable fits all needles. Warming wood may grab yarn too much for fast knitters, but knitters with achy hands love how their hands feel while knitting with these. Darker colored cables make counting darker yarn stitches a bit tricky. Knitters appreciate how the wooden needles grab slippery yarns, but the rounded wooden tips are best for bigger yarn weights. Darker colored needle tips make finding stitches when using dark yarns a bit problematic. The lighter weight aluminum needle is appreciated by knitters with hand fatigue. There is a large variety of sizes in one set, but the long-term durability may not be as good as the Hiya Hiya Interchangeable Knitting Needles.